Enjoy a peaceful moment to pray and reflect by using the Rose Scented Rosary. The design includes rose scented wooden beads that are smoothed and rounded for comfort. The Our Father beads are made of silver and are shaped like roses to help distinguish the separation of decades and to continue the rose theme. The center medal depicts the Immaculate Conception and is made of silver. A large crucifix hangs at the end of the design, beautifully finishing the piece. 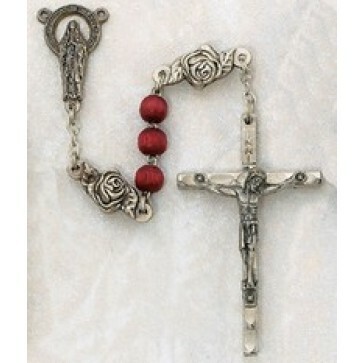 The Rose Scented Rosary is priced affordably and makes an excellent gift idea.